Sometimes some of the best meals are made from leftovers. What could be better than pork shoulder, perfectly smoked, finely pulled, juicy and tender? Using the leftovers to make these Smoked Pulled Pork Wontons. Well, I suppose that statement is arguable. Freshly pulled pork is pretty darn awesome. But I can say, without a doubt, that this is a genius use for any that didn’t get consumed. We did several events this summer, overestimating the amount of pork we’d need to satisfy the guests (like this event), leaving us with pounds of leftovers to either quickly use or freeze for later. There are worse problems to have I suppose. One of our favorite uses so far has been these pork wontons. 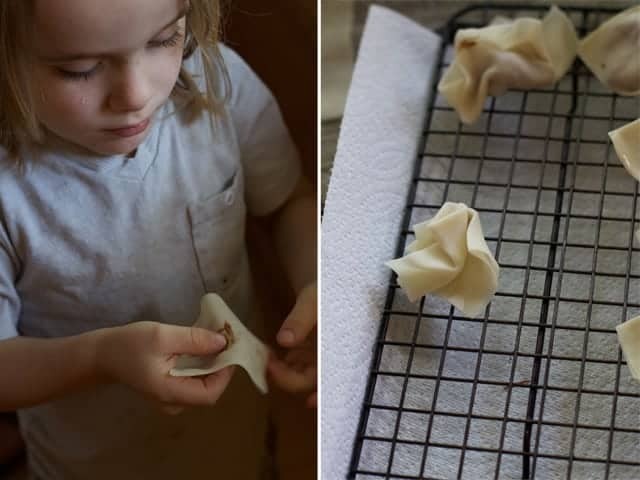 After making a few variations of this pork wonton recipe we discovered a few important things. Moisture is important for the filling. We added some BBQ sauce, green onions, and shredded cheese for added flavor and moisture to the filling. The dipping sauce is important. Since we have traditional barbecue flavors, we wanted to highlight similar flavors in the sauce (as opposed to going the traditional wonton route with a sweet and spicy chili dipping sauce). 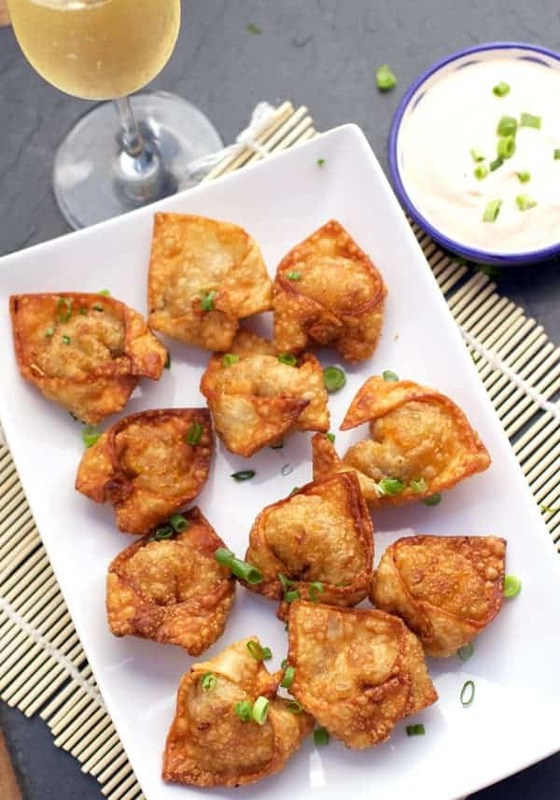 Our recipe combines sour cream, hot sauce, BBQ sauce, and other flavors for a tangy and delicious dipping sauce for these crispy and tender wontons. 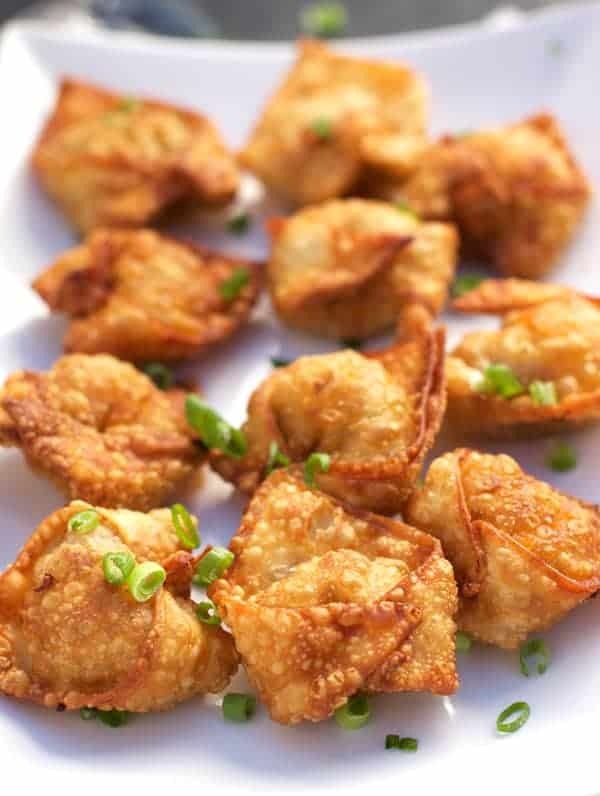 You don’t have to consume all of these crispy wontons immediately. They are good the next day too. Just reheat them in the oven on a baking tray so they don’t get soggy. First, you need killer smoked pulled pork! If you already have leftovers, awesome. 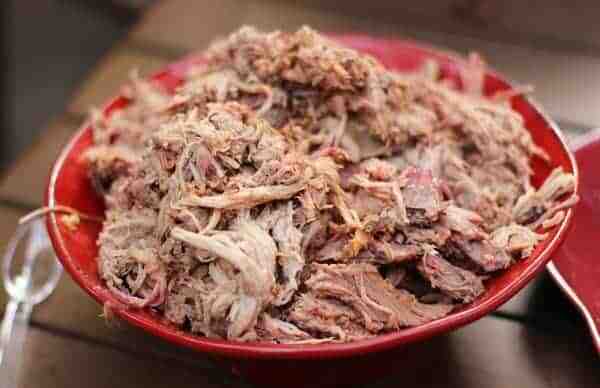 If not, check out our complete guide on how-to make the best smoked pulled pork. Now, filling the wontons may be the trickiest part if you haven’t done it before, but do not fret. My mom, in addition to a Mexican-food-making superstar, has a strong affinity for making egg rolls and wontons and has years of experience making her own versions. She taught me these tips. Take about 1 teaspoon of your filling and place in the center of your wonton wrapper. Too much filling could lead to a wonton explosion. Using your finger, lightly brush the outer edges with an egg wash (1 egg whisked with a little water or milk). Fold corner to opposite corner making a triangle. Pinch shut so there is no air getting through. Then fold the two ends of the triangle into each other, and pinch them together. See the step-by-step photos (below) of my excellent hand model (aka hubby) for his demo. Bravo, Sean. Bravo. Incidentally kids can also get involved. Or mix it with some Kansas City BBQ Sauce and make a really good pulled pork sandwich! 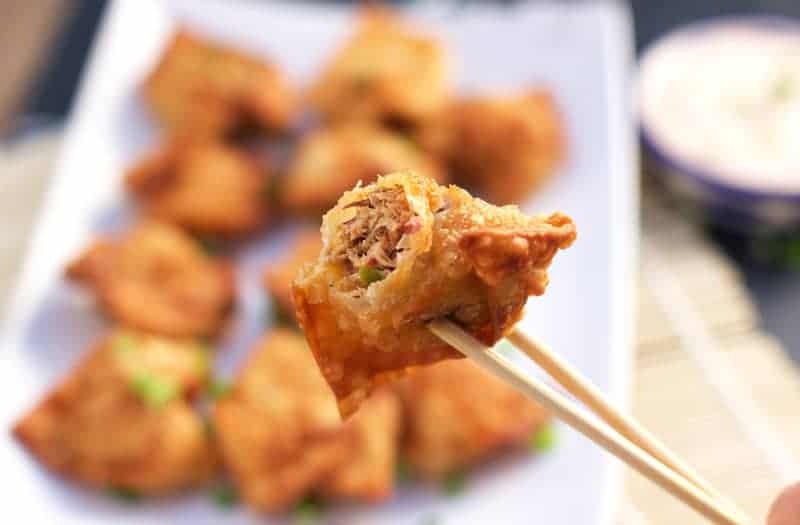 Smoked Pulled Pork Wontons are a fantastic use for leftover smoked pulled pork. 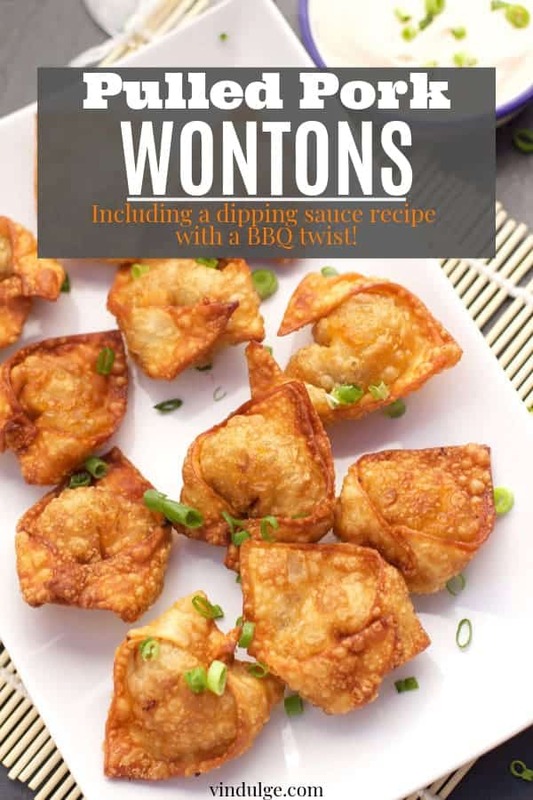 Also includes a great wonton dipping sauce recipe with a bbq twist. In a large bowl, combine the pulled pork, green onion, cheddar cheese, and BBQ sauce and mix to combine. Taste and adjust flavors. If it’s too dry add more BBQ sauce or a tablespoon of apple cider vinegar. In a small bowl add the egg and a tablespoon of water and whisk together. 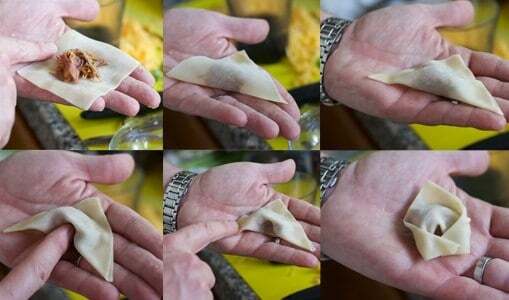 Place one wonton wrapper in the center of your palm. Place 1 teaspoon of the filling in the center. With your finger (of the opposite hand) paint the sides of the wrapper lightly with the egg wash. Fold over one side to create a triangle. Seal tightly, removing any air pockets. Fold the two opposite points together and seal together, using more egg wash if necessary. Place aside and repeat with remaining filling. Add oil to a frying pan (or wok) up to two inches in depth, and heat up until ready to fry (Medium high heat). Use a test wonton to see if the oil is ready. It should start browning quickly. Combine all ingredients in a bowl and mix together. Taste and adjust flavors to your preference. If don't want it too spicy, go light on the horseradish. If you want it more on the sweeter/BBQ sauce style, go heavier on the BBQ sauce. Adjust it to what style you want (spicy or sweet). Most traditional wontons will pair well with Riesling or something with a touch of residual sweetness. They play well with not only the sweet, tangy, and even spicy flavors, but the acidity is great cutting through the crispy wontons. But these aren’t your traditional wontons! These are BBQ inspired. That’s just how we roll. Instead of the sweet and spicy we have creamy with mild BBQ and hot sauce influences from the sauce. 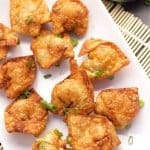 The wontons are equally crispy since they are fried. My two favorite wines for the nuances in these wontons are rosé and sparkling. And if you want the full effect, go with a sparkling rosé. 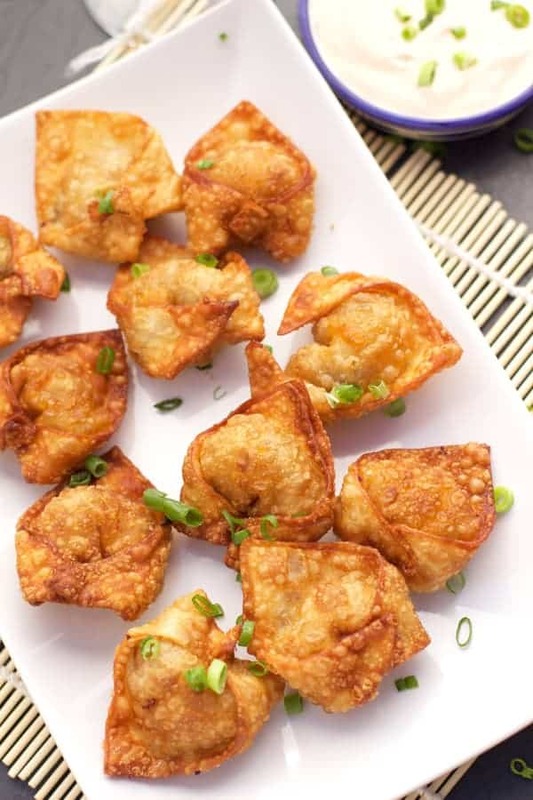 The acidity works well with the crispy wonton outer layer and the fruity flavors of the wine stand up like a rock star to the tender flavorful filling. These are going to be your most refreshing bet, outside of an ice cold beer of course (and ain’t nothing wrong with pairing these delicious smoked pulled pork wontons with a cold one).